A certain percentage of the ICDS projects and Anganwadi Centres will be located in blocks/villages with a substantial population of minority communities to ensure that the benefits of this scheme are equitably available to such communities also. The Government shall provide all possible assistance to Maulana Azad Education Foundation (MAEF) to strengthen and enable it to expand its activities more effectively. A certain percentage of the physical and financial targets under the NREGS will be earmarked for beneficiaries belonging to the minority communities living below the poverty line in rural areas. The National Minorities Development & Finance Corporation (NMDFC) was set up in 1994 with the objective of promoting economic development activities among the minority communities. A target of 40% of net bank credit for priority sector lending has been fixed for domestic banks. It will be ensured that an appropriate percentage of the priority sector lending in all categories is targeted for the minority communities. Under the schemes of Integrated Housing & Slum Development Programme (IHSDP) and Jawaharlal Nehru National Urban Renewal Mission (JNNURM), the Central Government provides assistance to States/UTs for development of urban slums through provision of physical amenities and basic services. It would be ensured that the benefits of these programmes flow equitably to members of the minority communities and to cities/slums, predominantly inhabited by minority communities. The proposal was considered in the Ministry. The Prime Minister has approved the proposal and a token provision of Rs 10 Crore has also been made in BE 2009-10. The Maulana Azad Education Foundation (MAEF) was established in 1989 as a voluntary, non-political, non-profit making society registered under the Societies Registration Act, 1860. The main objectives of MAEF are to formulate and implement educational schemes and plans for the benefit of the educationally backward minorities in particular and weaker sections in general, to facilitate establishment of residential schools, especially for girls, in order to provide modern education to them and to promote research and encourage other efforts for the benefit of educationally backward minorities. The Fellowship will cover all Universities/Institutions recognized by the University Grants Commission (UGC) under section 2(f) and section 3 of the UGC Act and will be implemented by the Ministry of Minority Affairs through UGC for students belonging to the minority communities. From 2009 to 2011-, 2665 students have been given to Maulana Azad National Fellowship to pursue studies such as M. Phil and Ph.D. The National Minorities Development & Finance Corporation (NMDFC) was incorporated on 30th September 1994, with the objective of promoting economic activities amongst the backward sections of notified minorities. NMDFC took the lead to start a parallel channel of micro financing w.e.f. 1/4/1998. This initiative was taken in order to reach the poorest among the target group, especially the minority women scattered in remote villages and urban slums who are not able to take advantage of the formal banking credit as well as NMDFC programme through its SCA. 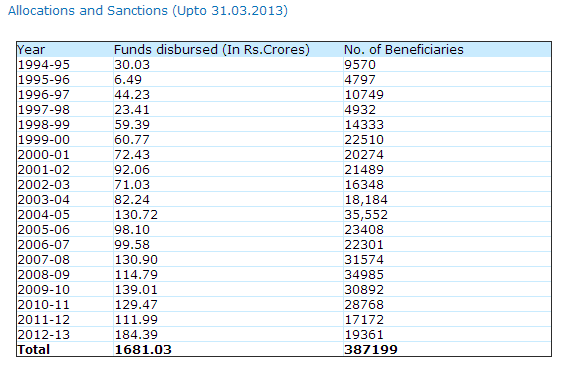 Under this scheme small loans up to a maximum of Rs. 25,000 per beneficiary are provided through the network of NGOs and SHGs. Funds are given to the NGOs at an interest rate of 1%, which further do the lending to the beneficiaries directly or through the SHGs at an interest rate of 5%. interacting with Government systems, banks and other institutions at all levels. Every year more than 50000 minority students are getting the post matric scholarship. The scheme aims to empower the students/candidates of notified minority communities, which are relatively disadvantaged section of our society vis-a-vis their skills and capabilities to make them employable in industries, services society, by assisting them as well as those institutions working for them, towards in-resilience to adapt itself to the market dynamics on a continuous basis so that the target groups are not deprived of the professional acumen demanded by the enhancing and business sectors in addition to the government sector. It has the built changing/emerging market needs and opportunities for employment at domestic as well as international levels. UGC has sanctioned 285 women’s hostels during the 11thPlan in 90 Minority Concentration Districts and released Rs 203.69 crore. The Centrally Sponsored Scheme of Teacher Education is under revision. It is proposed to establish 196 Block Institutes of Teacher Education (BITEs) – one Institute in a block of each of the 90 MCDs and the SC/ST dominated districts (other than the block in which a DITE is sanctioned). 08.09.2009 for implementation during the 11th Plan with an objective to make 70 million non- literate adults literate by the end of the Plan. The scheme has special focus on women, belonging to Minorities. It is proposed to cover 12 million Muslim (10 million women and 2 million men) under the programme. Saakshar Bharat is being implemented in 372 districts out of 410 eligible districts where adult female literacy is 50% or below as per 2001 Census. 61 minority concentration districts have been covered under Saakshar Bharat. Proforma for reporting and monitoring of loans to minorities have been devised. 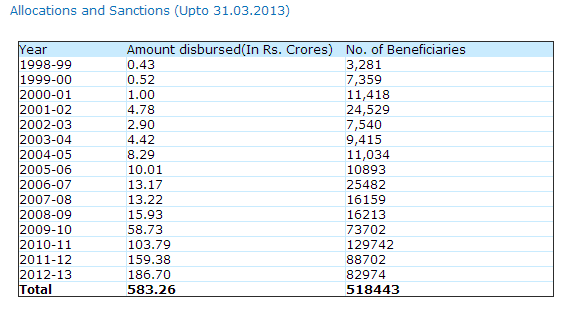 During 2012-13, 14,46,507 loan applications were received. 14,28660 applications had been accepted, 15,803 applications were rejected and 2694 applications are pending. As per the PM’s 15PP, 15% Priority Sector Lending by Banks should be earmarked for minorities. The RBI issues master circular every year in this regard. The Govt. has further advised the banks to capture community-wise data of PSL. The percentage of PSL going to minorities has shown steady progress form 10.6% in 2007-08 to 12.24% in 2008- 09, 13.01% in 2009-10, 14.16% in 2010-11, 14.55% in 2011-12 and 14.96% in Dec, 2012.